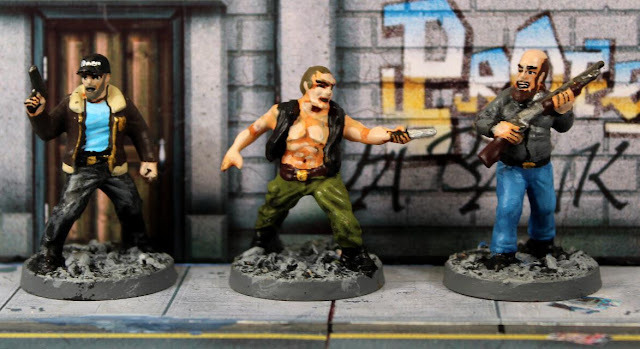 Here are another seven assorted survivors and gangers from the wave 1 boxed set of The Walking Dead skirmish game by Mantic Games. As usual, these are hard plastic 32mm scale figures. I start off with the Harrison sisters, Amy and Andrea at the far left. These were part of the group of Atlanta survivors that Lori and Carl Grimes joined when the zombie apocalypse kicked off. Amy, who is unarmed, did not survive long as she got bitten by a zombie that was part of a horde that attacked their camp. Andrea had to kill her once Amy reanimated as a zombie. Andrea then went on to be a superb sniper and was one of the longest lasting survivors in the comic series. Inexplicably, she was killed off at the end of series 3 of the TV series, a decision that rankled a lot of fans, including me. This pose of Andrea has her firing a 9mm pistol, which she sensibly holds in a two-handed grip. I should mention that Andrea is my favourite character in the comic series. Two more of the Atlanta group of survivors are Carol Peletier and her daughter, Sophia. In the comic series, Carol becomes increasingly unstable and eventually commits suicide. However, in the TV series, she becomes a hardened survivor and to date, she is still going strong. She is shown here armed with a knife. As for Sophia, she would appear to have victim written all over her. She becomes close friends with Rick's son, Carl, and in the comic series, when Carol dies, she is looked after by Maggie and Glenn. She is the longest surviving female member of the comic series. In the TV series, Sophia gets separated from the rest of the group in series 2 and is killed by a wandering zombie. Note that Mantic's game is based on the comic series, not the TV series, so the events portrayed within them should be regarded as canon. Moving on, at the far left is Deputy Sheriff Shane Walsh, who was the partner of Rick Grimes, before Rick was shot and hospitalised. Believing Rick to be dead, Shane and Lori begin a romantic relationship, resulting in Lori becoming pregnant. When Rick showed up, there was much friction between the two cops and when Shane attempted to murder Rick it was Rick who prevailed and he killed the psychotic Shane. The figure of Shane is armed with a 9mm pistol. Finally are a pair of gangers who are part of the crew led by Derek, whom I showed in a previous post. Mantic Games have called them Craig and Reggie respectively, but I added their surnames. Craig Gehring is a thug armed with a knife, not the best weapon to use when fighting zombies but better than nothing. Reggie Sobel is much better armed, carrying a pump-action shotgun, making him, by far, the most dangerous member of Derek's gang. Another great looking group of figures Bryan! Thank you most kindly, Major. More really nice looking figures Bryan, love the bits of story you've added, as I've never watched the walking dead, you make it sound like "EastEnders" with zombies (actually I think half the cast of EastEnders could be zombies! ), I certainly make me wish I was dead! Many thanks as always, Roger. As far as I'm concerned, everyone in "East-enders" and "Coronation Street" should all become zombies so that they can die twice! To stop the plague from spreading both areas should then be nuked. Yes, I hate soap operas almost as much as I hate all sports! Thanks, Simon. I'm going to carry on until I complete ALL of the wave 1 figures. Why stop now when I'm on a roll? You certainly did your bit Zomtober & then some Bryan they look great. Greatly appreciated, Frank. It's been a blast! Great looking survivors Bryan, you have been very busy while I was away with all your other posts. Thanks, Dave. I agree with you 100% about the comic series and the TV series having their own separate strengths and weaknesses. As always, great looking figs! Well done, you have done some great work on these survivors. 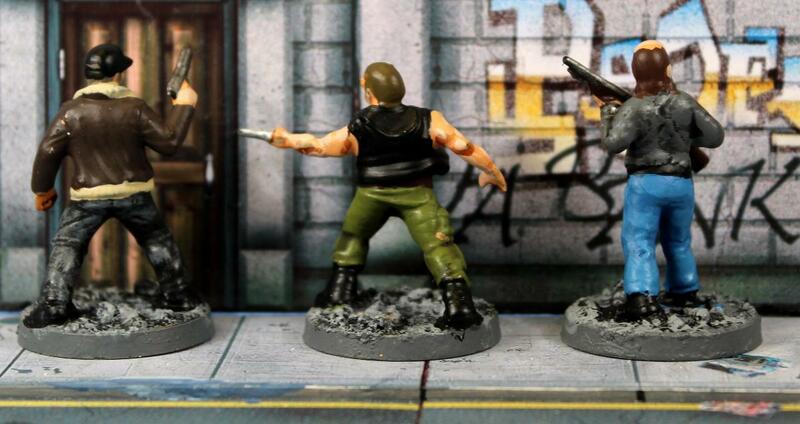 Love TWD minis. Many thanks, Nobody667. I'm mightily impressed with all of the TWD sculpts. It's a shame about Shane's personality as I like the figure the best of all, nice job on the leather jacket, I believe you did one of the zeds in a similar manner, I'm going to have a look to see now. Well done on both quantity and quality a good month of painting even for you. Well done Bryan another great haul. Well done! I haven't read through the comic series, mostly just the AMC series. Though from the description provided, they have made quite a few changes! Many thanks, Terry. Whilst the comic series and the TV series share much in common, there are enough differences to make them separate entities. Perhaps they exist in parallel universes.